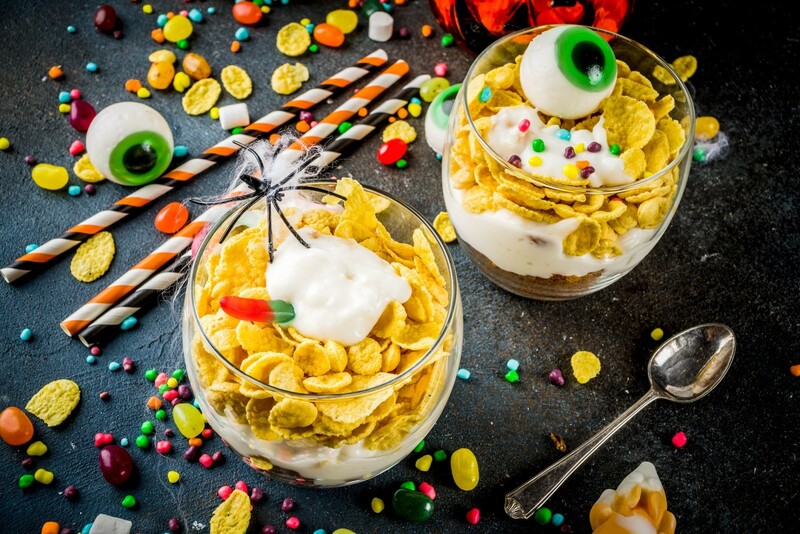 Halloween is truly made for candy lovers, but it’s not just trick-or-treaters that get in on the goodies. 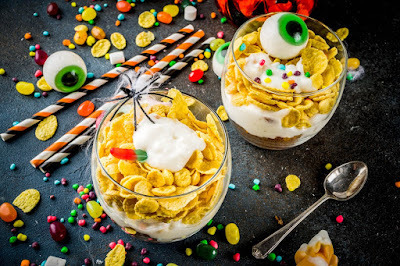 If you’re hosting or attending a Halloween shindig this year and want to impress, check out our easy and delicious spooky Halloween candy treats! These last-minute treats strike the right balance between a healthy after-school snack and a candy-coated indulgence. 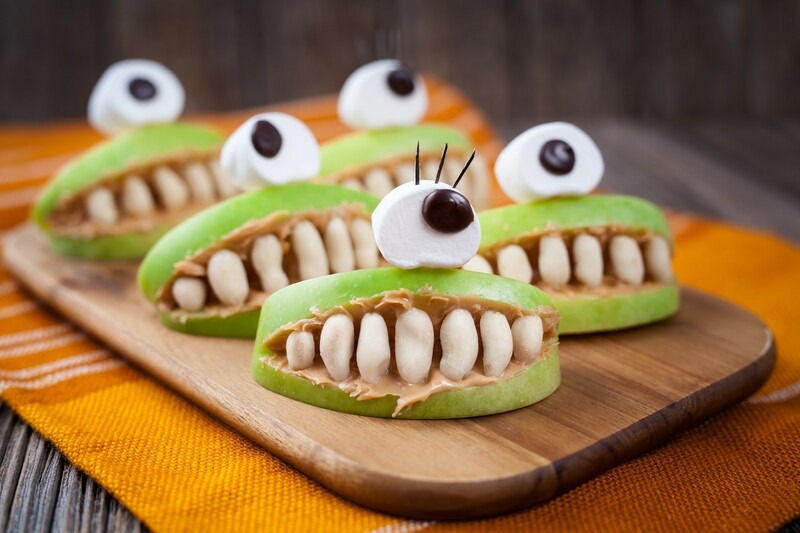 Use an apple slicer to make the apple wedges that form the base of the monster mouth. Next, spread a little bit of peanut butter on the apple skin. Just a little bit will do - the monster’s teeth will show better if you can see his lips! You can use jellybeans for the teeth, and an M&M on top of a marshmallow to make the eye. Have fun with the colors so you can create a red-eyed monster with green teeth, a brown-eyed monster with yellow teeth or any color combo you can think of! Cookie butter makes a gooey, fall-flavored alternative if there’s a guest in the haunted house who can’t have nuts. Worms in dirt is a versatile Halloween favorite. 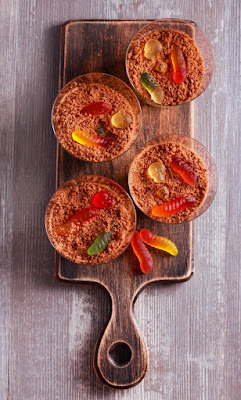 You can make any base you want - pudding, flavored gelatin, chocolate cake - and serve it in cups or make a haunted tableau inside of a cake pan. Crush up lots of Oreos in a plastic bag with a rolling pin to make the top soil. Then, Rice Krispie treats covered in fondant or molding chocolate make perfect headstones. Squish, roll and form the Rice Krispie treats into different shaped headstones for a spooky graveyard feel. Drape them in fondant or cover in molding chocolate to complete the look. Spooky greys and black work great! Finally, cover your sweet and spooky scene with gummy worms or sour worms. Maybe this last one is best for those couple of weeks between Halloween and Thanksgiving when you’re trying to make leftover Halloween candy disappear. Really, a layered candy trifle is appropriate for any time of year. This one is super simple: layer cubes of cake, whipped cream and candy in one big dish or in individual cups and dig in! The Wholesale Candy Shop has freaky good deals on Halloween candy for making scary and silly treats for all the little boils and ghouls. Shop our secure store all year or stock up on trick or treat candy a little early!